You know how unusual it is for me to get interested in a cooking project - for me, cooking is just that tedious lag in the day before the eating can start. But every once in a while, I get the bug to Make Something. Today's inspiration came when Emma and I finally got to visit 99 Ranch Market, a huge Asian grocery store in Plano. I think we were both missing all those fun foods we enjoy in Hawaii. Plus, this place is so big and so exotic, it's a field trip all by itself. Our visit helped us collect the final ingredients we needed to make one of the most fun grab-and-go foods on the Islands: Musubi. Now, I went to high school in Hawaii, but somehow never heard of this stuff. But my sister and her family, who have lived there forever, taught us all about it on this last trip. We're hooked now. 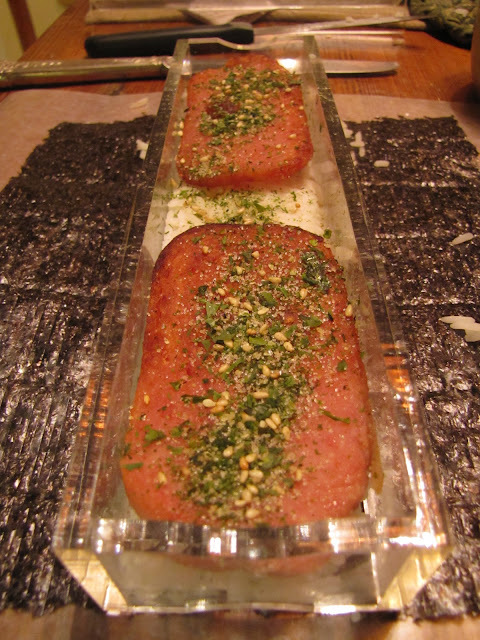 It's kind of like sushi, but simpler and heartier. You make a bunch, when you make it, so it lasts a while in the frig as a filling snack. Like most things in Hawaii, it starts with rice. When I got home from my sister's last fall, the first thing I did was run out and buy a rice cooker. Sure, I can cook rice in a pan, and have for years, but these things do all the work, and if you get the water part right, they're almost fool-proof. 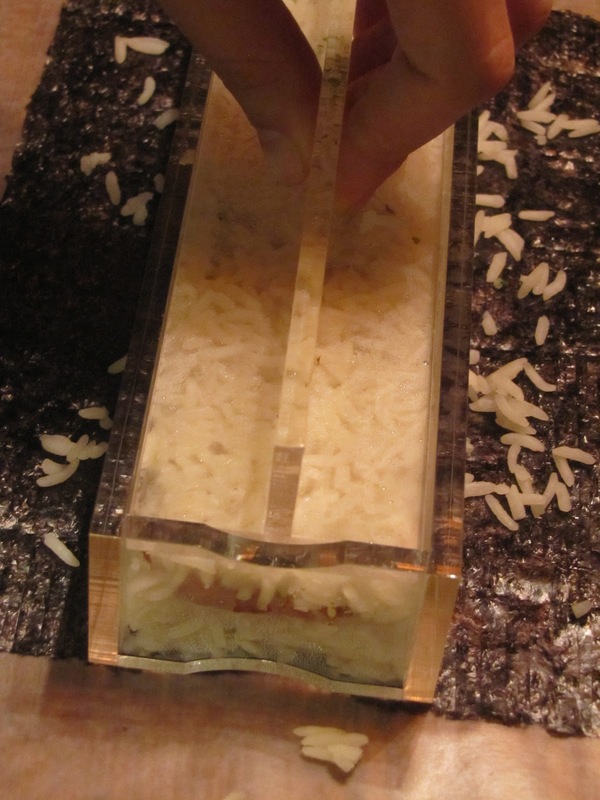 Here's my sister's mystical system for getting the right amount of water in your rice without formal measuring: pour in as much rice as you want (I use long grain white... nothing special), and then add water. If you touch the top of the rice with your finger, the water should come up to the first knuckle. No matter how much or how little rice you use, it seems to work every time. Next, I let the rice soak for about 15 minutes before pushing the GO button on the rice cooker. Walk away and let the magic happen. That's right. Spam. Don't laugh - there were about 20 different varieties available at the Asian market today. They know a good thing when Hormel cans it. You can't argue with 75 years of classic canned meat. Slice it thin and brown it in a pan on both sides. Set it aside to cool. I suppose if you're too good for Spam you could experiment with bacon. But it just wouldn't be the same. 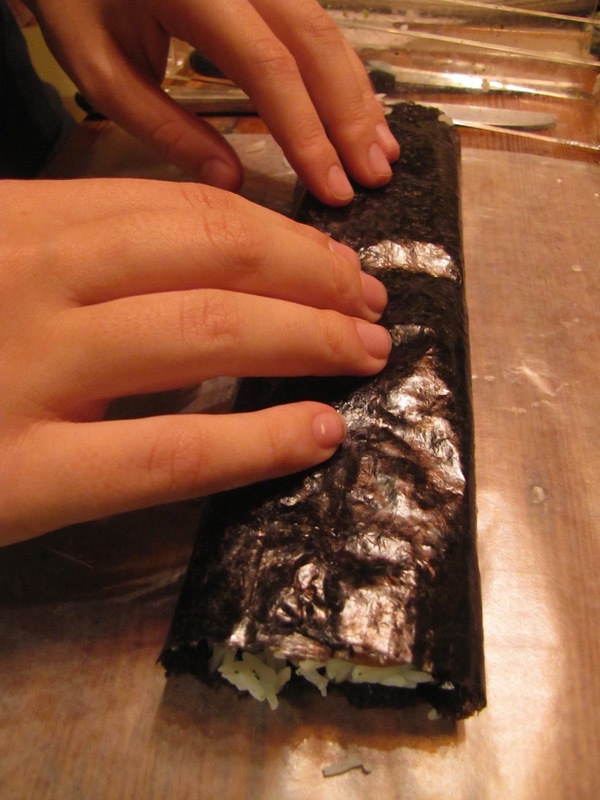 Sushi nori - the thin, black, papery seaweed sheets that they wrap around sushi. Ten sheets to a package. Inexpensive and indispensable. 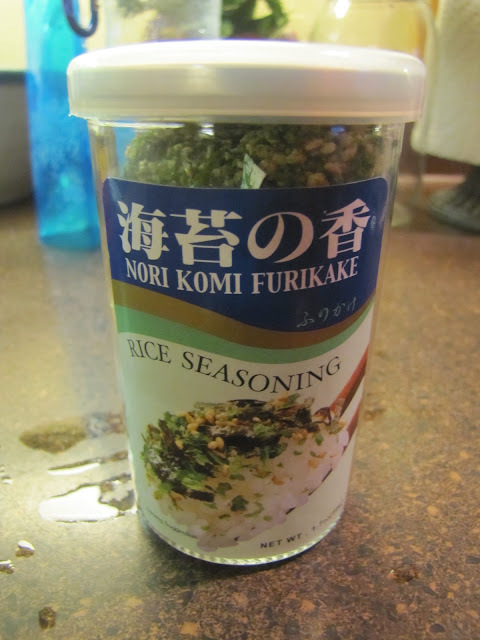 One of my favorite seasonings: Furikake... sesame seeds, seaweed, salt, and some other stuff. (My nieces and nephew insist on adding it to popcorn.) Adds some interest to boring stuff like plain rice. That's it. You're ready to put it all together. 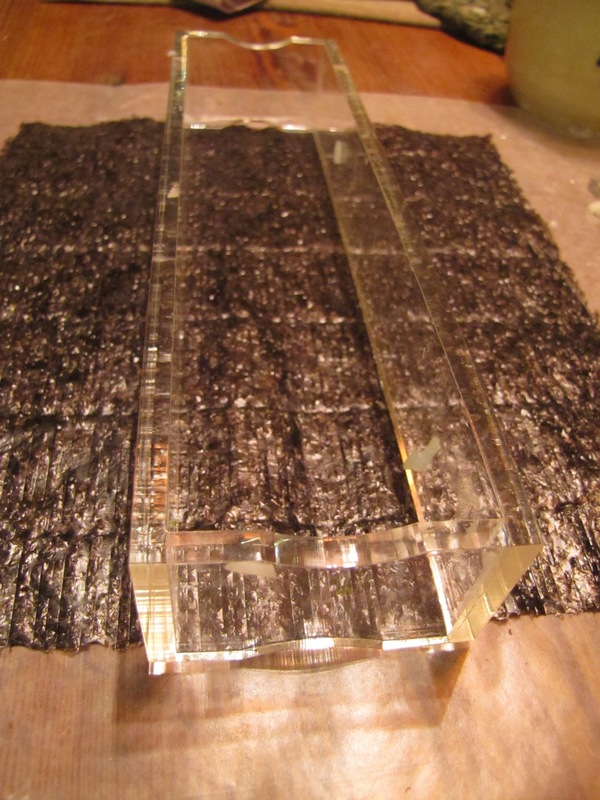 Lay out a sheet of nori on a cutting board. Center your handy-dandy sushi press in the center. I got my press in Hawaii, but I bet the Asian stores here have them, too. Ack. Blur. Emma is a very quick assembler. Fill the form a bit more than half full with rice. Press it down with the, uh, presser-thingy. Add two slices of Spam. 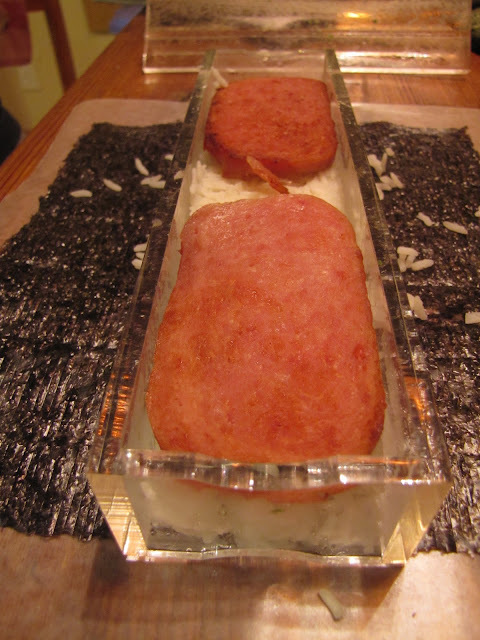 We leave a space between them because we'll be cutting the finished musubi in half. 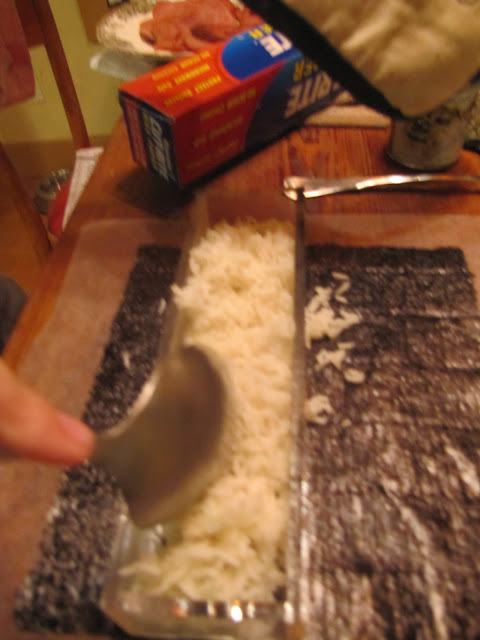 Add another layer of rice, and press again. Carefully remove the form and roll up one edge of the nori. Wet the other edge of the nori, which makes it sort of self-adhesive. Kind of like wetting the flap on an old-fashioned envelope. I use my finger dipped into a cup of water. Fold this edge over the first, and "glue" it down. 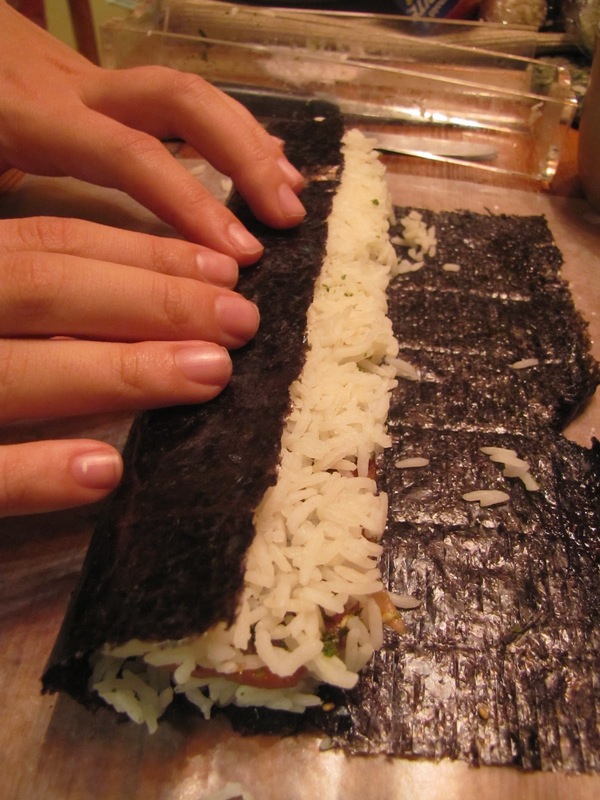 Cut your musubi in half and cover each piece with a piece of plastic wrap. Repeat, to make as many as you like. These are a favorite picnic food in Hawaii. 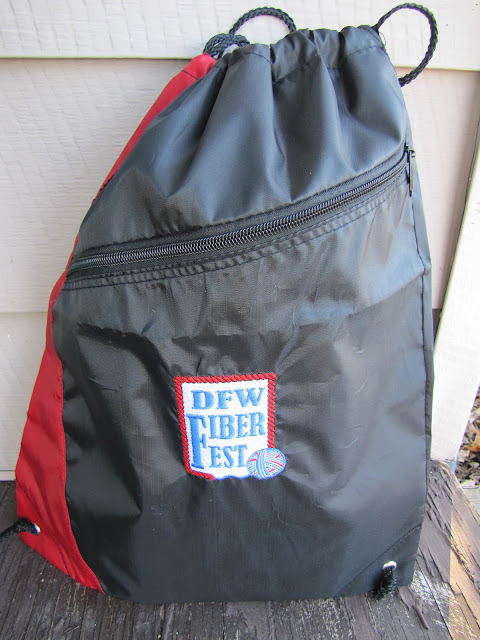 Perfect to pack for a day at the beach. D'oh! I'll add that in next time. We're loaded up with shoyu. We have stocked up with all the essentials. Thanks, K! My Japanese-American college roommate used to make that all the time! She was a 4th-generation Angelino (from Los Angeles, I mean) and her grandparents stayed with friends in Ohio during World War II rather than be interned in the camps, and they used to make that because they missed sushi so much. I was in awe that my roommate (somewhat of a foodie) would buy Spam! That looks delicious! I'd 2nd the shoyu! And I heart Ranch 99! !